Amazon Smile — Canvasback Missions, Inc.
Did you know you can donate to Canvasback when shopping on Amazon? Amazon has a shadow version of its website called Amazon Smile. The sole purpose of this “shadow” Amazon is to give to charity! (Given that, it’s probably more appropriate to call it a “ray of light” version of Amazon). 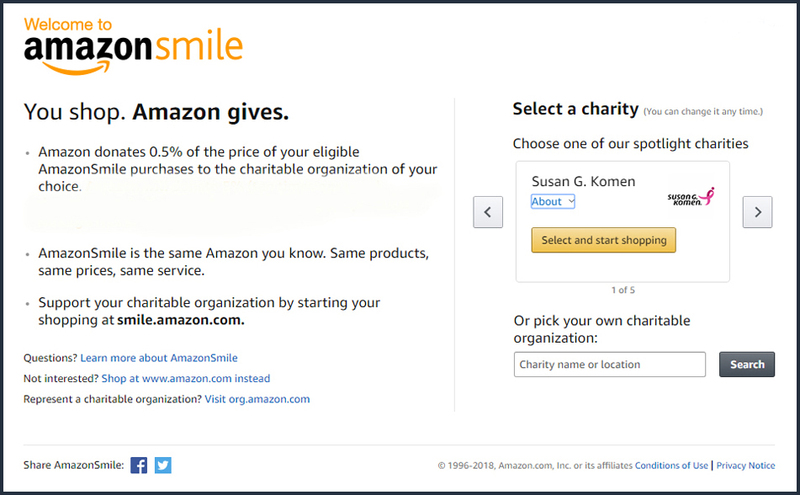 When you go to the URL, smile.amazon.com, you will be able to shop as normal, except that a percentage of all your purchases will come to us as donations! A detailed step-by-step process on how to support Canvasback via Amazon is below. 7. A confirmation page will appear that asks you to confirm you understand that your purchases will only support Canvasback if you make them at smile.amazon.com – if you are on the regular Amazon site (amazon.com), your purchases will not support us. 8. Check the box to say you understand, then the “Start Shopping” button below it. 9. Your home page will appear, as well as a pop-up window that has an option for you to install a helper in your browser that will automatically re-direct you to smile.amazon.com instead of the regular Amazon site, so you don’t have to remember each time. You can either install it, or dismiss the window. 10. You will notice a few differences to your home page now. First – Amazon’s logo now includes the word, smile. Second – below the search bar, it tells you that you are supporting us, Canvasback Missions. If you see these, you know you’re on the right page. 11. Proceed with your shopping as usual!